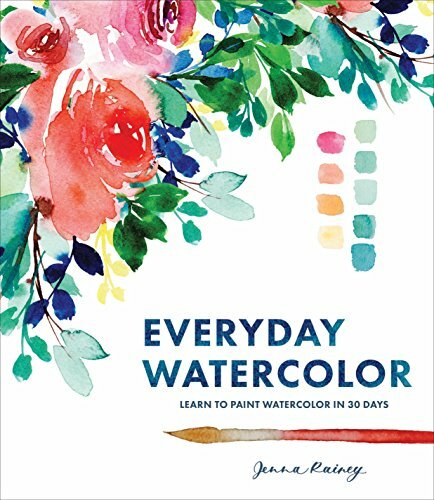 Everyday Watercolor is a watercolour instructional book with 30 days of projects to get you up to speed with various watercolour techniques. This book is written for beginners so anyone can jump right in. The book starts off by introducing the various materials you may need, very basic colour theory and techniques, and then goes straight into the daily projects. Each daily project starts with a sketch, choosing a colour palette, learning and applying a watercolour technique. There's explanation for each step or technique involve so it's not just following blindly but you also get to understand the concept and reasons behind. This makes it easier to learn and understand the techniques. The projects and easy to follow along and examples easy to replicate. Each project is sort of self contained where you get to paint a simple subject, mostly plants or animals. This is unlike other watercolor instructional books where the techniques learned are used to paint a complete painting. This book does not talk about the art fundamentals that goes into the making of a good painting, e.g. things like composition, foreground background, hard and missing edges to draw attention. This book focuses only on the individual techniques. Overall, this very accessible and hands-on book does a good job at imparting basic watercolour techniques and concepts.